Comparing the dating scene in California and New York is a lot like comparing apples to oranges; they are extraordinarily different, and which is better really depends on you. One thing remains true though: the best cities for young singles are the cities with a lot to do, which both Los Angeles and New York City have in spades. It's impossible to make broad assumptions of people based on the state that they're living in - but we're going to do it anyway. The people you’ll date in LA range from the typical surfer bum to the high-powered Los Angeles executive but in general, they tend to be less career-oriented and motivated than those in New York. Even California men who are more driven to succeed such as the aspiring actor, writer, and Scientologist, are generally more laid back, calm, and collected - but they tend to be doing things on their own timeline. California is the place for the millennial, and Los Angeles is one of the best cities for young singles who just want to chill. New York men, comparatively, are more focused and eager for excitement. There's a culture of "trying new things" in New York; whereas someone in California might want to hang out at a friend's place on a Saturday, a New York guy will almost always be trying a new restaurant, pub or club. His Zoosk profile is a great way to find out exactly what his scene is and if your taste matches up. If his interests aren’t 100% compatible with yours remember to keep an open mind – you just might discover a new hobby or guilty pleasure! Los Angeles women tend to be health-conscious, free spirited and laid back. You’ll find they drive eco-friendly cars, adore their free trade coffee, and are looking for a man who is interested in the same things they’re into. Don’t be surprised if they invite you to join their 6 AM run! New York women are independent, worldly and sophisticated. They work and party hard, knowledgeable in a variety of subjects and are super fashionable. Many of them are highly educated and highly motivated, and they are more likely to be businesswomen than talent. And above all else, they love their city! California dates have the advantage of the great outdoors; California daters tend to hit up harbors, beaches, and hiking trails - and are generally more likely to look for something outdoors and physical. California also has a fantastic nightlife - especially in Los Angeles and is known for their clubbing scene. New York dates have the advantage of the entertainment scene, and is one of the best cities for singles who enjoy arts and culture such as the theatre and galleries. New York has some of the most wonderful food in the world, and has something for every taste and budget. A traditional New York City date will begin by hopping on the subway or calling a taxi rather than meeting somewhere. This creates some bonding time on the infamous New York City transportation lines. From there you’ll find yourself hitting up the latest trendy restaurant-bar. Check out the gal's match.com profile to see what her favorite cuisine is, or if you’re both feeling adventurous, head out to a place neither of you have been - perhaps that spicy Korean joint everyone’s been raving about? That’s bound to create fun memories! 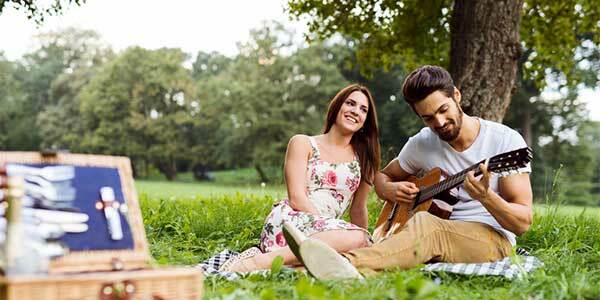 There are affordable areas of each state - and there are date ideas that are nearly free. While costs between the two cities and states are similar, New York and New York City are absolutely more expensive. You'll likely find yourself spending about 20% more for a traditional dinner and a movie date in New York vs. California – and don’t forget the cab fare! But that doesn't mean there aren't inexpensive dating options available - it just means that you're going to need to work a little harder. For California, there's always the potential of a trip to the beach and a walk along the coast; for New York, there's always a picturesque park picnic. Get a bit creative and you can be frugal without being cheap. With all those differences, there is one thing that California and New York have in common: an extraordinary amount of young, polished professionals ready to start their lives together.